Trick or Treat on Mainstreet is made possible by the CCRV Rotary Club. Still looking for a Halloween Costume or great deals on candy? Check this Monstrously Big Halloween Savings Available at Walmart.com or head to Amazon. Trick or Treat on Mainstreet is FREE to the public. This Halloween tradition that is run by the Cherry Creek Valley Rotary Club is something the entire community looks forward to each year. Mainstreet is frightfully fun with ghouls and goblins throughout the land… so set off on your quest for sweets. Many of the shop owners all along East Mainstreet and in the Baskin Robbins shopping center will have candy and treats for the little ghosts in your family as well as booths for other local businesses. What are the hours of Trick or Treat on Mainstreet? All the booths will be open at 3:30 pm and will close at 7:00 pm on October 31st. Mainstreet will close at 1:30 pm to allow for setup and will remain closed until 9:00 pm to allow for tear down. The PACE Center has authorized its lot to be used which is located at 20000 Pikes Peak Ave, Parker, CO 80138, There is street parking around the PACE Center and down Pikes Peak Court and Pikes Peak Drive. H2O’Brien Parking Lot will be open for use. How to participate and hand out candy to the kids. Local businesses may participate in the event in several ways. The participation fee is $0 (FREE) and new this year there is no deposit for your booth. Please contact info@trickortreatonmainstreet.com for more information on sponsoring a booth or click here for more information. Please consider volunteering for this wonderful community event. Teenage volunteers welcomed as well as adult volunteers. Click here to fill out the form to sign up to help. to hold all your tasty treasures. Our favorite moment from past Trick or Treat on Mainstreets: Thriller Flash Mob, watch for rumors of the time to be revealed on social media. Who puts on Trick or Treat on Mainstreet? The Cherry Creek Valley Rotary Club has sponsored Trick or Treat on Mainstreet since its inception in 2007. 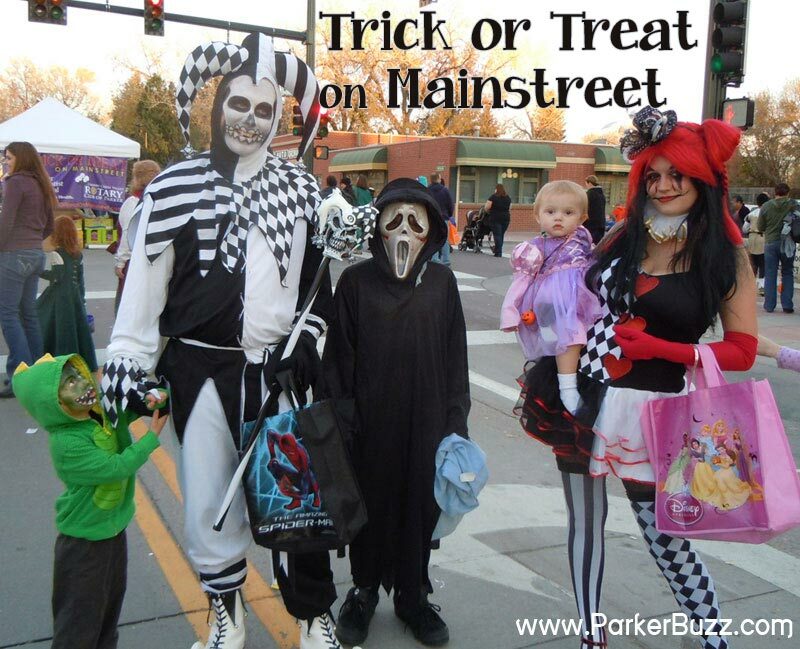 Why does The Cherry Creek Valley Rotary Club host Trick or Treat on Mainstreet? The Cherry Creek Valley Rotary Club has several fund-raisers throughout the year including the Smokin’ Brew Barbeque and Parker Brewfest and more. The CCV Rotary Club hosts Trick or Treat on Mainstreet as a thank you to the Parker community for their support of our fundraising efforts, which go toward helping the community and the world. The event also allows Parker businesses to thank the community for supporting their businesses as well. What does CCV Rotary do for the local community? CCV contributes financially as well as by volunteering at several local organizations including Homes for our Troops, Project Sanctuary, Women’s Crisis Shelter, Parker Food Bank and Douglas County Support Center. The CCV Rotary also provides dictionaries to Parker 3rd graders and copies of the Constitution to Parker 5th graders. While this is a fund-raiser for the club, the event brings vendors and patrons to Parker who contributes to the local economy. Why do you charge businesses to participate? The CCV Rotary club makes a significant financial contribution to the event. The donations made by sponsors help off-set some of the expenses involved with hosting Trick or Treat on Mainstreet.